Two chemists in the College of Arts and Sciences have been recognized for their ongoing work in organic chemistry and the life sciences. Yan-Yeung Luk and John Chisholm, associate professors of chemistry, have received major grant awards from the National Science Foundation (NSF) and the National Institutes of Health (NIH), respectively. Luk is using his $355,800 grant to study the chemical biology of mammalian cells and bacteria. Chisholm has been awarded $318,200 to explore synthetic approaches to pyrroloindoline natural products, whose properties include antitumor and antibacterial activities, and may have therapeutic value in Alzheimer’s disease. Luk’s NSF project seeks to chemically control the bioactivities of microbes in well-defined materials and environments, shedding light on the molecular scale beyond empirical observations and applications. His research group has developed and validated a new class of molecules that controls how bacteria attach to surfaces to form biofilms and metamorphose into disease strains. (“Imagine tadpoles turning into frogs,” he says of the transformation process.) To understand how these molecules work, Luk’s group will use a new type of hydrogel material that absorbs large amounts of water and presents drug targets in a “clean” environment, enabling them to study the binding, or attractive interaction, of these new molecules. 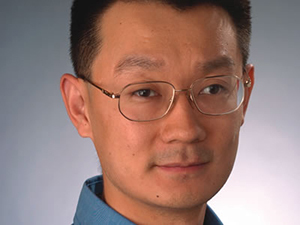 Like Luk, Chisholm is an organic chemist whose research involves synthesis and catalysis. 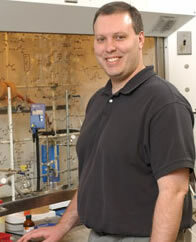 Chisholm’s NIH grant supports research into new methods for the synthesis of pyrroloindoline alkaloids, an important class of structurally complex natural products that contain multiple nitrogen atoms. Natural products, he adds, are traditionally a rich source of therapeutic agents and pharmaceutical candidate molecules. Both grant awards are designed to support meritorious research, expose graduate and undergraduate students to research and strengthen the research environment of the University.